Redevelopment Plans for 3701 New Hampshire Avenue | Park View, D.C.
Perspective of building designed for 3701 Georgia Avenue. On Wednesday, July 29, Rooney Properties LLC filed and application with the Board of Zoning Adjustment (BZA) related to their planned redevelopment of 3701 New Hampshire Avenue — the former Sweet Mango building. 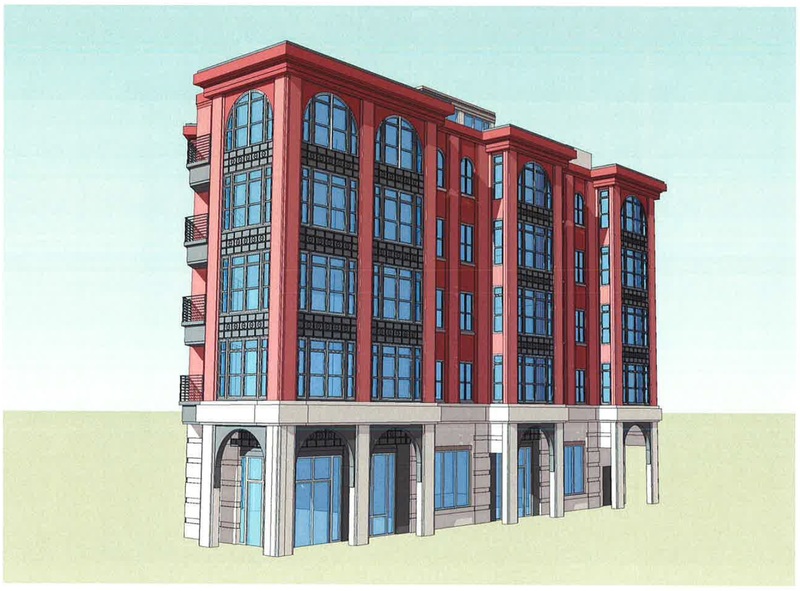 An initial look at the application shows that the relief being sought is related to parking and lot coverage in order to construct a five-story, traditional style building. According to the drawings and application, the project would create a sixty-five foot, five story residential and retail building. There would be a total of approximately 22,840 sq. ft. in the entire structure, with 4,564 gross floor area in the ground floor retail space. 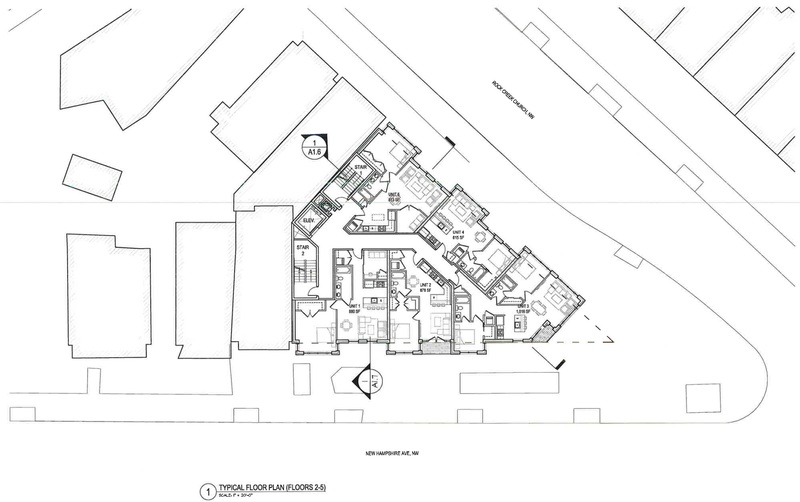 Their would be 21 one- and two-bedroom units including 1,480 sq. ft. of affordable housing. The entrance to the residential units would be on New Hampshire Avenue. The design appears to be an excellent complement to the existing architecture in the community, and should be particularly complementary to the row houses on Rock Creek Church Road to the south. I also noted that the plans show that the trash and recycling would be contained within the building when not being collected. This is a huge improvement over the outdoor dumpsters currently on the site. The proposal conforms to zoning in every way with the exception of the parking requirements and lot coverage. According to zoning, a building of this size would contain a total of 13 parking spaces. However, the size of the lot along with its unusual shape make it impractical to create any real parking on the site. Being located directly across the street from the Georgia Avenue-Petworth Metro should also make the strict adherence to the requirement unnecessary. The other relief being requested is with regards to lot coverage. Again, size and shape have a role in this. While the ground floor retail space will be in compliance with the Zoning Regulations, the residential section will exceed the 80% threshold. 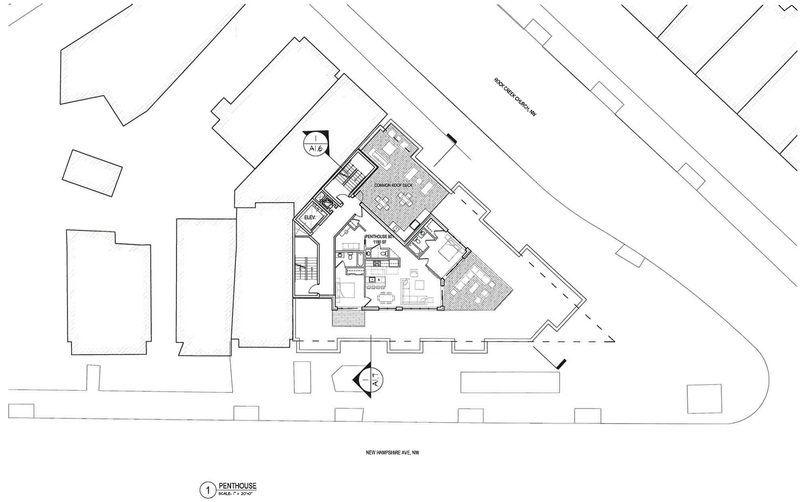 It is important to note that overall the proposed building appears to have a similar footprint to the buildings that are currently on the property. Representatives of the development plan to attend both the ANC 4C and ANC 1A meetings in September, providing an opportunity for residents and the commissions to ask questions and weigh in. Based on the information at hand presently, the project appears to be a huge improvement over the current use of the property. It is also exactly what should have been built in 2009 when the CVS property was developed — a huge missed opportunity to add more housing and vibrancy to the community. This entry was posted on August 3, 2015 at 6:01 am and is filed under Architecture, Development, Housing, Retail. You can subscribe via RSS 2.0 feed to this post's comments. This looks like a HUGE improvement. I agree regarding the architecture. It looks like the developer is trying to do the right thing. Lets hope they bring in quality retail tenants which will hopefully spur better retail on nearby blocks. There are too many check cashing, pay day loan, liquor stores (selling synthetic drugs!) in this area. The developer has my support for this buidling. The sooner the better. Looks great. Welcome to the neighborhood! A terrific addition. Looks good. Although I wish they would go through a PUD to try and get an additional level of residential since its so close to metro. I do find it odd that they are adding in new tenants to the current building if they area already starting the BZA process. They could have their approvals by Jan at the latest. I just hope they don’t delete the roof cornice details the way they did on that otherwise nice building on GA at Kenyon. I am confused as to timing. It seems that this would be a couple of years off given they are moving a restaurant into the space which hasn’t even opened. Any insight? The leases of the two businesses moving in are only for a year. Seems only about 8 percent of the residential space will be affordable. That strikes me as low. Also, any clarification on what they mean by “affordable”? They call it “redevelopment” after they raised the rent and pushed out the businesses and families. Geesh. I hate how all the old places are turning into condominium land. Moreover, why must all they be one and 2-bedroom housing! And a far cry from what families need. Pushed out? Mango closed because they couldn’t run a business. Fires, bad service, not enough clients. No one pushed them out. They closed before the building was sold. Did the “old places” have 3 and 4 bedroom units for said families? No, they were crammed in 1 and 2 bedroom units. Can we legally allow them more density (seeing as it’s practically on top of the metro) in return for spending money on things for the community that we like? Like refurbishing our parks/schools/roads?